Milton Busker specializes in what he calls "suit folk." But in practice, that's more of a dress code than a subgenre for the dapper Vermont songwriter. Most of the songs on his latest album, Milton Busker & the Grim Work, would have been radio rock 10 years ago, out on the dial where Americana blends into "adult contemporary." The record is full of catchy, up-tempo, smartly written pop songs, executed by a tight five-piece band. Busker is blessed with one of those "voice made for radio" package deals. His tone is easy and clear; he always nails his notes but never seems to be trying. The man is also a quiet beast on the guitar, fluid and steady. Thanks to the Darwinism of a busy downtown scene, Busker's talents have attracted a choice lineup of backing musicians. The most integral piece here is Jom Hammack on mandolin and vocals. His touch is deft, but even in the background, that distinctive bluegrass timbre shapes every track on the album for the better. Another clutch player is Dave Ball, who fills out the sound as needed on electric guitar and backup vocals. He also cuts admirable takes on harmonica, stepping out for a ripping solo on bar-stomp anthem "Let's." And the rhythm section of John Treybal on bass and Dave Simpson on drums elevates the album. Their ironclad pocket and rock-steady approach makes every track shine. It's safe to say that this full-band effort is Busker's true debut. He's been on the scene honing his craft for a long time and has recorded some nice demo work, too. But his gifts have never been framed this well before. The opening salvo showcases Busker's best songwriting. The band kicks off "The Basement Song" with a jaunty, pirate-jazz groove that's familiar to any Radio Bean regulars. But when the chorus opens up, the song transforms into something soaring and serene. Layered vocal harmonies and instrumental finesse make it clear this outfit is aiming high. "Glad to See You Go" hits like a smack to the face, a barn-burner rock cut that's as much Screaming Trees as Traveling Wilburys. A wry breakup song that sees Busker mostly turn the blade on himself, the tune has careful pacing and phrasing that keeps you sold every second. It takes a lot of work to make simple sound this good. Up next is "That Person Aside You," which is the album's lead single for good reason. It's a flat-out beautiful song, a ballad of bottled lightning, showcasing Busker's expert touch for both melodies and lyrics. Milton Busker & the Grim Work is a finely crafted artifact, and there are more gems to unpack here than space permits. Suffice it to say, this is damn good music, and we're lucky to have this man working with this band. Long may the Grim Work reign. 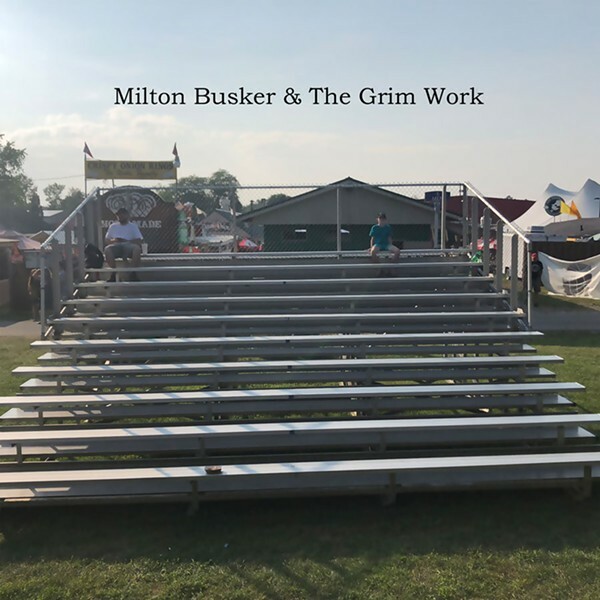 Milton Busker & the Grim Work is available digitally and as a limited-edition CD at miltonbusker.com. Milton Busker & the Grim Work celebrate their album release Saturday, November 17, at the Light Club Lamp Shop in Burlington.